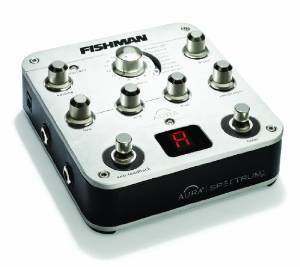 The Fishman Aura Spectrum product is of interest to those who play, perform with the acoustic guitar. It brings about a near miked environment for piezo saddle pickups which is most apparent on nylon string classic guitars in which the performer plays single notes. The benefit is that you can get a more acoustic sounding guitar without having to setup a mic while performing live. This also removes mic feedback. My reviews are completely unbiased - and will stride to show you both the pros and cons of products. As do many, I read reviews on other sites like Amazon which is a starting point for product consideration. There are products which are difficult to evaluate by reading others comments and ratings, such as this Fishman pre-amp. So what I did is to present performances of others using the nylon stringed classic guitar. Steel string chord strumming is not the test, it is the articulation of vibrato and expression utilizing single notes that helps to filter out which product provides the best results, all within the classic style of performing. Performances Using the Aura Spectrum D.I.